Founder -- After earning computer science degrees at Berkeley and Columbia, Dan spent 25 years in computer science research and development, primarily at Bell Labs and Bell Communications Research. In 2001, he realigned his work life to focus on his other great geeky passion: flying. Dan has been a pilot for 20 something years with most of his flight time in gliders and power planes. Since becoming interested in hot air airships, Dan earned his Commercial pilot's rating for hot air balloons. When not thinking about flying, talking about flying, or actually flying, he has been involved in the founding of several computer start-up companies and non-profit organizations. Over the same period, he has managed two investment funds. 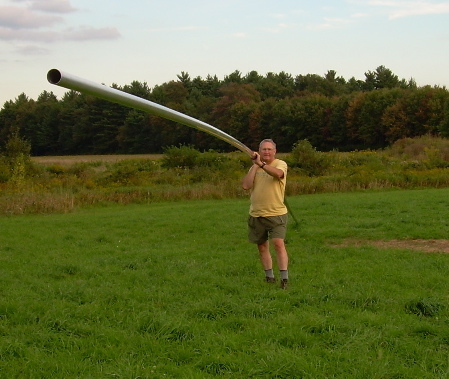 Mike making one of our early, tethered flight tests in Summer of 2006. Director of Mechanical Design and the co-builder of Alberto -- After studying Aeronautical Engineering at FH Munich Germany, Mike moved to the US in 1990 and became an A&P/AI Mechanic as well as a Commercial pilot. Overall, he has built, maintained, and flown both type certified and experimental aircraft for over 12 years. Mike is the owner and operator of Flightworks of Northampton, Inc.
Wayne hauling around an aluminum rib section. Crew Chief and many, many other useful roles -- Wayne's academic and professional life, all prior to any connection with airships, started with a B.S. in Physics and Mathematics and an MS in Journalism, both from The University of Illinois, followed by a Ph.D. in Communication from Michigan State University. Career activities have ranged from underwater acoustic research for the Navy to faculty member at Syracuse University and Babson College (interpersonal communication topics). After academia, he established and ran his own management consulting firm for 11 years. Although relatively new to aviation, he has started the work to get his pilot's certificate. Structural Design and Great Ideas -- John is a noted designer, inventor, and entrepreneur. John's work is held in the permanent collection of the Smithsonian where he was also recently featured in the "Inventors at Play" exhibit at the Museum of American History. His licensed product designs are currently sold in more than 20 countries. All Things Ballooning -- One of the "fathers" of the sport of modern hot air ballooning and co-founder of the Balloon Federation of America, Don Piccard's interest in ballooning began in 1933, when he flew in a gas balloon with his mother, Jeannette Ridlon Piccard. For more than 50 years, he has concentrated his enthusiasm and energy in ballooning. In 1988, Don was honored with the Elder Statesman of Aviation Award from the National Aeronautic Association and in 2002 he was inducted into the FAI Ballooning Commission Hall of Fame. Experimental Balloon Building -- Brian is one of the most experienced (if not the most experienced) experimental balloon builders in the world. Since 1971, he has built more than 130 balloons of all shapes, sizes, and materials, including six hot air airships. Brian owns and operates the Post Mills, Vermont, airport where he maintains an extensive experimental balloon construction facility. Structural and Design Engineering -- Chuck started his life in advanced aerospace engineering at the White Sands Missile range. He spent much of his career working with Burt Rutan as the vice president of Engineering and the technical director for Scaled Composites, Inc., the world's premier experimental aircraft engineering and development company. Chuck now heads his own engineering consulting firm, Mechanical and Composite Engineering. 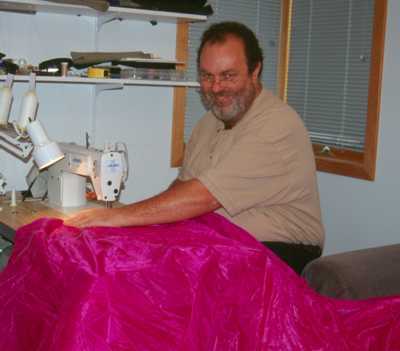 Balloon Construction and Repair -- Paul has been been flying, building and maintaining balloons for 25 years. Shortly after receiving his Bachelor of Fine Arts degree in photography from The Rhode Island School of Design, Paul began ballooning for his livelihood. He soon started designing and fabricating his own ballooning accessories. 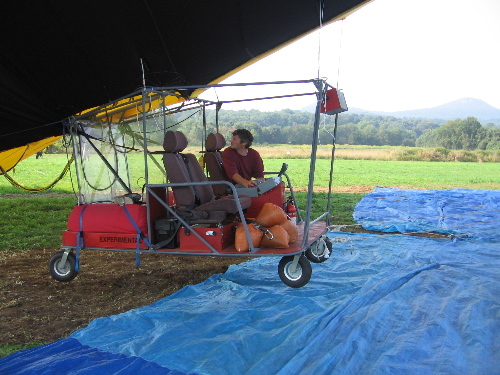 Requests from other pilots for Paul's designs led to the creation of Stumpf Balloons. Today, Stumpf Balloons has grown into a full service balloon center including a certified balloon repair station, hot air balloon flight services, cold-air promotional balloons as well as hot and cold air balloon banners. Computational Fluid Dynamics -- Blair is an assistant professor in the University of Massachusetts Department of Mechanical and Industrial Engineering. Blair's work currently focuses on Turbulence Modeling and Numerical Methods. Since joining UMass, he has assembled one of the largest clusters of computing power in the world devoted solely to Computational Fluid Dynamics.